Low-Carb Broccoli, Ham, and Mozzarella Baked with Eggs has lots of broccoli with a little ham and mozzarella baked with the eggs for a combination that’s really delish! And it’s also Keto, low-glycemic, gluten-free, and can be South Beach Diet friendly; use the Breakfast Dishes to find more recipes like this one. Click to PIN Low-Carb Broccoli, Ham, and Mozzarella Baked with Eggs! I don’t usually post on Sunday, but as I mentioned in yesterday’s post, I’m in Costa Rica! It’s lovely here and tomorrow when I’d usually be sharing a recipe I’ll be leaving way early in the morning to go on a river cruise. So tonight while I have a minute I’m reminding you about this favorite breakfast casserole. If you’re one of the many people who are starting a low-carb eating journey today or tomorrow, you definitely should try this recipe. 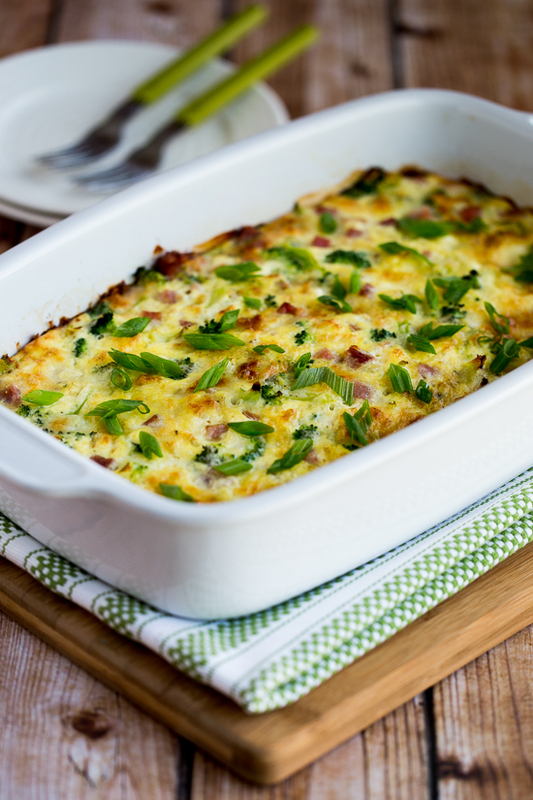 This breakfast casserole is loaded with low-carb ingredients, plus I think trying to eat vegetables with every meal is one of the best healthy eating tips ever, and I’ve made this quite a few times to keep in the fridge for several days of tasty breakfasts. 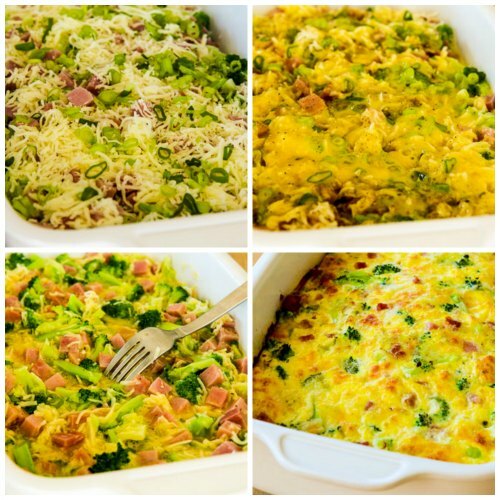 I’ve enjoyed it in a flatter version and also in the version in these photos which has a bit more broccoli, ham, and egg, and I’ll give a range in the recipe so you can decide which version you want. But if you like broccoli, ham, and mozzarella, give this a try; so many people on Pinterest seem to be liking it! And this is a perfect Weekend Food Prep recipe if you want to save the recipe and make it next weekend! For this recipe use 1-2 cups of lean diced ham and about 1/3 cups green onions. I used 6 whole cups of barely-blanched broccoli, but you can get away with less. 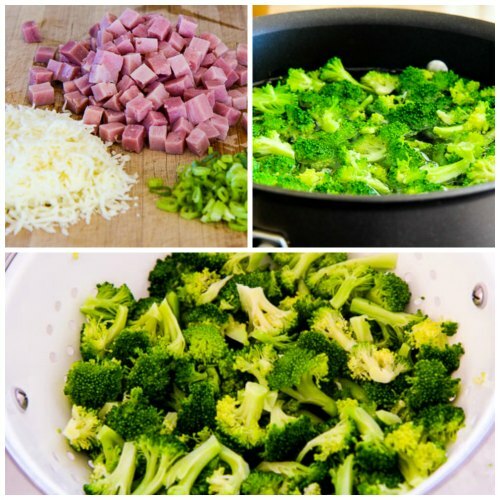 Spray a 9×12″ casserole dish with non-stick spray and layer the broccoli and then the ham. Then put grated low-fat mozzarella and green onions over that. Season to taste with Spike Seasoning (or another all-purpose seasoning blend) and fresh-ground black pepper. Beat the eggs and pour them over the other ingredients. Then use a fork to “stir” just until all the ingredients are coated with egg. Bake at 375F/190C for 35-45 minutes (depending on which version you choose and how done you like it. Serve hot. Broccoli, Ham, and Mozzarella Baked with Eggs can be kept in the fridge for at least a week and reheated in the microwave. I love Spike Seasoning for eggs, but use any all-purpose seasoning you like. This recipe was created by Kalyn. Broccoli, Ham, Mozzarella and eggs are all good low-carb ingredient choices, so this Low-Carb Broccoli, Ham, and Mozzarella Baked with Eggs will work for low-carb or Keto diet plans, and as long as you use lean ham and low-fat mozzarella, this recipe would be approved for any phase of the South Beach Diet. Use low-fat dairy if you’re following the letter of the law for South Beach; other low-carb plans will prefer full-fat dairy! Thanks for the great recipe! Do you think it would work in a crockpot? I have some egg recipes on the site like this one that use the Casserole Crock Slow Cooker, and that’s the slow cooker I think will be best for this type of recipe. But if you have a large oval slow cooker that will probably work. It will probably be a bit thicker so the cooking time might be a bit longer than the Casserole Crock. Let me know how it works! This was pretty good. My 4yo didn’t love it, even with ketchup. However my 1yo destroyed it. This was easy to make and I used a frozen bag of broccoli which I cooked half way through. The result was broccoli in the casserole which was slightly crunchy not soggy at all. Glad you liked it. Thanks for info about using frozen broccoli. Thanks for reminding me about this dish. I didn’t comment when I first made this, but it really was incredibly tasty. I diced-up a thick slice of lower-sodium ham (Krakus Polish Ham) which I bought at the deli counter, since less sodium is always a good thing. I used 1/2 of the amount of real eggs, and the same equivalent of “Egg Beaters”….in order to make this healthier. I always use light sour cream. BTW, thanks Kalyn, for turning me on to spike Seasoning! I found it at my local health food store. I bought the one w/o sodium, so that I can adjust the sodium in whatever I’m making. This stuff is TERRIFIC, and I’m now obsessed with it. So glad you have enjoyed it and glad you’re now a fan of Spike Seasoning. I think it’s good in so many things! Funny this recipe should come up again, I had the older one open in another tab! I made this recipe for my baby’s 1st birthday dinner because he could live off scrambled eggs, it seems. It was delicious and all I changed was almost fully cooking the broccoli beforehand to make sure it was soft enough. So fun that happened; glad you enjoyed it! Pingback: Toddler Mealtime Escapades – Where's My Epidural? Can this be made without the ham as a vegetarian option? Yes, absolutely. You might slightly increase the amount of broccoli and cheese. Hope you enjoy! I added bacon and a few peppers to mine. It came out amazing!!! Delicious recipe. I love the sound of that; glad you enjoyed it! Is there anything I can use in place of the eggs that would still make this a low carb meal? Maybe make it into a casserole with cauliflower rice, with the cheese holding it together. That’s the only thing I can think of! I am looking for the nutrition facts on servings.Do you have those available somewhere? I just made this & it looks DELICIOUS! Hi Stacy, glad you enjoyed it! I’m not able to provide nutritional information for the recipes for several reasons, including the additional time it takes, the difficulty in doing it accurately, and the sheer number of recipes on my site. If you look after the recipe itself, I give two links (where it says “Nutritional Information”) for suggestions of two ways to get that information. Yes, but it would be best to let it come to room temperature before you cook it. Otherwise the center may take too long to cook before the top gets too brown. I don’t have access to all-purpose seasoning. Do you have a suggestion on what seasonings I could use instead? This recipe sounds awesome. I always use Spike Seasoning in egg dishes like this, but any brand of all purpose seasoning (like Mrs. Dash, etc.) would work. I got all these all-purpose seasoning options when I searched on Amazon. If you’re asking what specific spices go in those blends, I wouldn’t know about that. But any spices you would normally use in eggs will be fine, even just salt and pepper. I found Spike Seasoning at my local health food store, or you can order it from Amazon.